The Browning Collections — a catalogue of the poets’ library, presentation volumes, manuscripts, likenesses, works of art, personal effects, and other association items. The Brownings’ Correspondence — a register of the poets’ correspondence, with text of those letters published by Wedgestone Press in The Brownings’ Correspondence. Supporting Documents — a register of secondary material relating to the Brownings, with text of those documents published by Wedgestone Press in The Brownings’ Correspondence. Contemporary Reviews — a register of the reviews of the Brownings’ works, with text of those reviews reprinted by Wedgestone Press in The Brownings’ Correspondence. Printed Works — a bibliography of works by and about the Brownings. Browning Likenesses — six galleries of images of Browning family members. 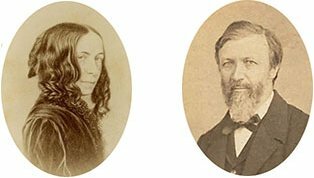 Lady Layard’s Journal — personal observations by a friend of Robert Browning. The Joseph Milsand Archive — a catalogue of the Milsand collections, and a checklist of the correspondence of this Browning friend. The Browning Letters — scans, with text, of letters provided by participating institutions. The Journal of William Surtees Cook — a record of the Barretts and Brownings, by a family member. 19th Century Women Poets — poetry written by women in English and published from 1800 to 1900. The Brownings: A Research Guide and other components have been supported by generous donations from the following: Dr. & Mrs. Howard R. Dudgeon, Jr., of Waco, Texas; the Bob and Anna Wright Family Foundation of Vernon, Texas; Anne Birkhead of Houston, Texas; the Margaret Cox Estate of Houston, Texas; and the Guardian Angels of the Armstrong Browning Library. The Armstrong Browning Library invites visitors to this site to convey additions, corrections, or comments to Jennifer Borderud, Director.